The typical resistor for power system is the neutral grounding resistor. 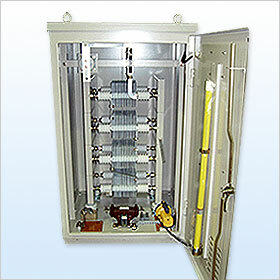 It performs neutral grounding in main transformers and generators, and restrains fault currents caused by grounding accidents to power lines, so as to protect equipment against damage in power plants and transformer stations and to prevent induction faults to communication lines running along power lines. The transformer excitation plunge electric current restraint resistor and the resistor for higher harmonic removal filters that are installed in large number are used with the purpose to improve the quality of electric power. The corresponding voltage: It corresponds from low pressure to a super-high voltage. Insulation verification It is executed with the 1500kV impulse voltage supply system and the 250kV power-frequency withstand voltage device. Earthquake resistance It has the structure, which is based on standards, and withstands resonance sine 3 wave maximum horizontal acceleration 3m/s2.